We had a great week diving into more content. Math: We finished our introductory lessons from www.youcubed.org and students are doing an awesome job of using critical thinking skills to problem solve and collaborate. Next week we will begin our Numbers & Base 10 unit. home. Genius Hour will take place every Wednesday, and we are so excited for students to begin stretching their thinking. You can check out our portal for more information. Click here to see more detailed information and to watch a video about Genius Hour. Social Studies: We have continued working on building a positive classroom culture, and responsibility. We will soon begin talking about government, and we are so excited to be teaching this during an election year! "What is Book Talk Tuesday?" Beginning September 13th, students will be doing their own book talks during our reading block. 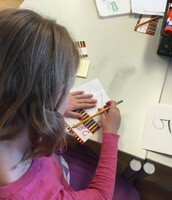 A letter went home today with more information and a save the date for your child's book talk. You also can always check our portal for more detailed information, as well as a schedule. This activity will help students build speaking & listening skills from the common core state standards, as well as demonstrate reading comprehension. Please contact us immediately if there is a conflict with the day your child has been assigned. Click here to see the schedule and detailed information on our portal. Homework has officially started in The Think Tank! A rationale of our choice of homework in 3rd grade was sent home today. You can also always check our portal to see the weekly homework menu in case your child's homework menu gets misplaced. If you have any questions, please feel free to contact us at anytime. Click here to see the first homework menu, which is due on September 9th. What is this coding "stuff" ?! This year we will be using coding in various ways in The Think Tank. Every Wednesday we will have "code academy" in the afternoon. We will also integrate coding/computer science into our math and science lessons. Coding helps students with computational thinking skills, problem solving, higher level thinking, and so much more. Click here to read an article from Forbes magazine titled "Teach Kids to Code and You Give Them a Skill for Life." (When you click the link you will have to then click "continue to article"). Click here to watch a video from on "CBS This Morning" that explains the rationale behind teaching students coding at a young age. 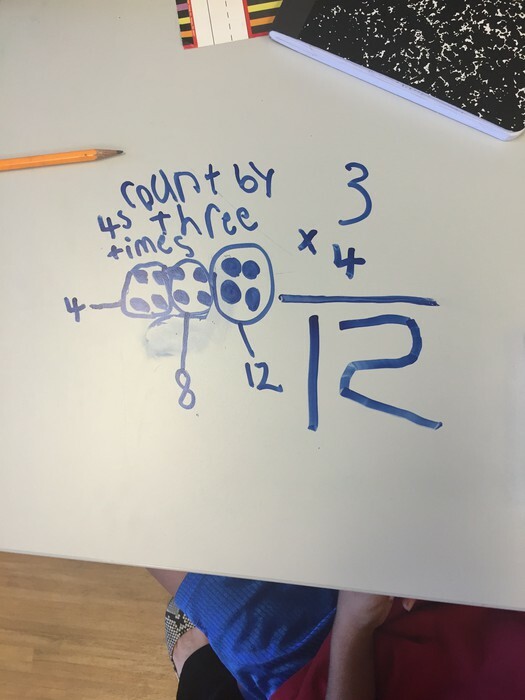 Does your child use his/her fingers or draw pictures when solving a math problem?! This actually isn't a bad thing! So often using fingers for math is seen as "babyish", when in reality, knowledge of your fingers can actually be a better prediction of math performance than traditional tests. Students who use their fingers a lot and know them very well, often do better in math than those who do not. Fingers are important for brain growth and math performance! 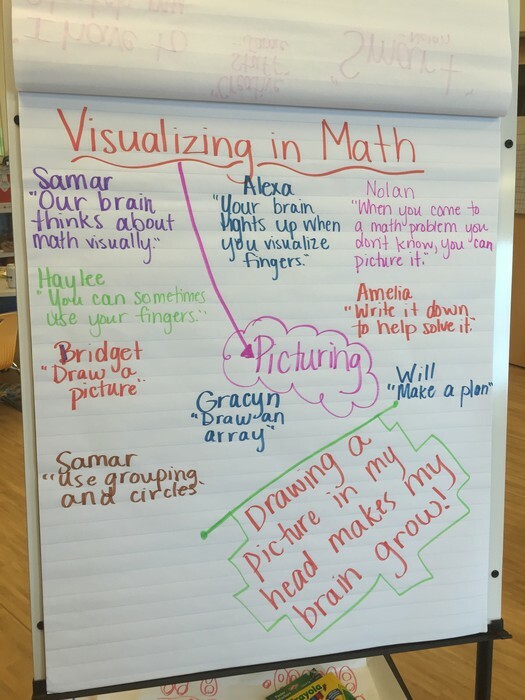 Click here to watch a video about how your child's brain stretches when they visualize math. 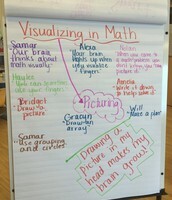 Look at all the ways we came up with that we can visualize math! We learned this week that mathematicians show their work so that other mathematicians can understand. 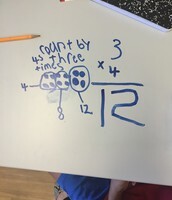 Check out how Aryan did that to show 3x4=12. 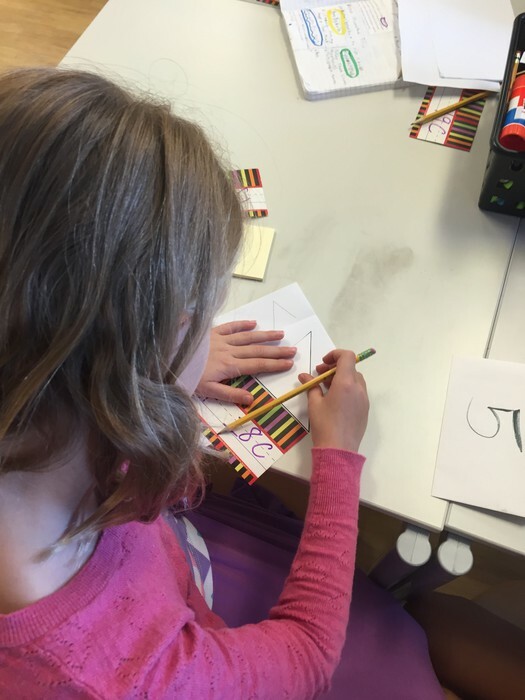 Gracyn uses a ruler to explore and measure the sides of a triangle while trying to discover what makes a triangle isosceles. Don't forget to follow us on Twitter to see our daily happenings.